Over 5 months ago I got a simple email from Kolkatta. It was Samar Saha, my guruji. He was looking into the possibility of coming to America for a month and a half with nothing but his tabla and a performance visa. He wanted to know if it would be possible for me to arrange some concerts and workshops. He said that I was the first person he contacted. Luckily, I had the Lyceum concert being set up around the same time, so it was easy for me to include him, and guarantee him some decent pay. I wrote back and told him about the concert in my hometown, and that I would work on arranging workshops and more concerts in the Ann Arbor area. That is where it all started. 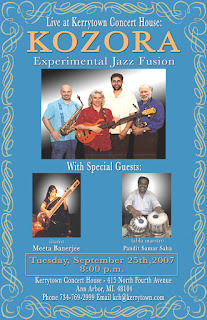 Over the next few months I was contacting people at the University of Michigan, telling all my students, rehearsing like crazy with the KOZORA group, making posters, having pictures taken, e-mailing a ton of people, and having recording sessions with Meeta Banerjee in hopes of making a C.D. to sell at all the shows. (which can now be purchased online by CLICKING HERE). By the time Samarji arrived at the Amtrack station in Ann Arbor, (he had just performed in Chicago the night before), everything was set. He got in on Monday evening on the 17th of September. We drove up to Meeta's parents house in Fenton, MI. which is where he stayed for most of his time in Michigan. We had a nice dinner and laid out the itinerary for the next couple of weeks. The following day was the first concert. It was at the University of Michigan music school, at the McIntosh theater. I set up the performance with the help of Rohit Setty, who is the outreach coordinator at the Center for South Asian Studies, and Steven Rush, a music professor. 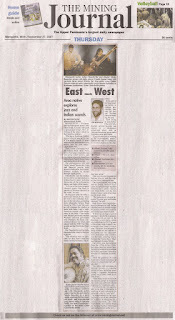 Steve Rush had written a grant for a flute player from Varanasi named Dr. R.K. Srinivasan. The grant was for a month and a half long residency at the music school. The concert on the 18th was to be his first, and what a treat it was to be able to arrange Samar Saha as one of the accompanists. There was also a mrigdangam player named Rohan Krishnamurti, who is based out of Michigan. Srinivasan's claim to fame is that he is well versed in both Hindustani, (North Indian), and Carnatic, (South Indian), music. So it was nice to have both the tabla and mrigdangam there to accentuate the different styles. For this concert I was the sound guy. It was one of the first shows I have ever done as just a dedicated sound guy, so I felt a litte out of my element. It was great though. There were so many people at the theater that they actually set up chairs on the stage and had people sitting all around the performers. The concert went very well. They got a standing ovation for over two minutes. I was just happy to be listening to my guruji perform. Next on the itinerary was a 3 day tabla workshop. I hosted it at my house and most of the attendees were my own students. It was such a treat to watch the students I have been teaching interact with my teacher. I learned so much about teaching tabla over those three days. I was also able to type out all the compositions that he taught and give everyone a nice neat copy. It was a sight to see....my whole studio filled with tabla. The sound was great, it reminded me of my CalArts days when we would have lessons with Swapan Chaudhuri, and everyone would be packed into the little tabla room. Another great thing about having the workshops at my house was that I got to spend a lot of time talking about the music for the upcoming shows. I was getting a little nervous about playing drum set with tabla due to the fact that the drum set is such a loud instrument. Guruji quickly put my mind at ease, (as he usually tends to do), and simply said, 'no problem'. He even got on my kit and tried it out... ...I think he will be sticking to the tabla! With the workshops successfully completed, Guruji had Saturday off, which he spent relaxing and practicing in Fenton, (yes, even a world renowned master of his instrument STILL practices every day!). 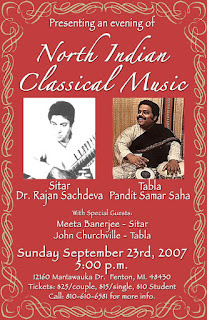 The next event would be a house concert at the Banerjees in Fenton with Meeta and myself opening for Samarji on tabla and Dr. Rajan Sachdeva on Sitar. It was a small venue, but it was packed with people and the energy was high. Meeta and I started it off by playing just a couple of pieces, then Rajanji and Samarji played for around 40 minutes, then Samarji did a tabla solo with Meeta playing lehra, (which is a melody that just repeats over and over, making the melody act like a rhythm instrument normally would). It was the first time I got to see Samar play a tabla solo and I was completely astonished and amazed at his fingers. I don't even want to try to describe it. I believe it must be seen to be understood. Here are some pics from that night. An added bonus came that night in Samarji's tabla solo. He played at full speed and complexity the very same compositions the he showed all the students at the workshop, (most of whom were sitting in the audience). That night I started to get the feeling that this whole thing was becoming a very in depth, rich, and comprehensive study for me both as a student, a teacher, and a performer. After the successful Sunday concert, Monday was another day of rest before our concert on Tuesday at Kerrytown Concert House in Ann Arbor. This was a very special concert for me because it would be the first time I have gotten to play drum set with my Guruji on tabla. I was so excited, although it was a lot of work for me to load my drumset, tabla, and sound system, set it all up, and then have just a 5 minute break before the performance. I was tired, but once the music got going, a surge of energy came over me. First KOZORA did a couple of compositions, and then we brought Samarji to the stage. Ken surprised everyone by asking Samar to play a little solo before we played our rehearsed material. Samarji of coarse said 'no problem' and went right into an amazing tabla solo that brought everyone to their feet. Whew....a tough act to follow. At least he was staying on stage with us! We played through the pieces and some of the grooves that were created felt so good I can only describe it as being a runner whose legs just grew 5 inches, or being a bird whose wings just got a new set of bigger feathers. It was drumming like it has only been in my dreams. O.K. enough gushing...I loved it! Meeta joined us for the last two pieces. The first was a simple Bengali folk tune called Batiyali, and then the last piece was the big tabla/drum set duet with the rest of the band playing lehra. It was a little more difficult for them to act as the rhythm keepers than I imagined it would be. Especially when Meeta broke her main string half way through and could not play anymore. We held it together and made it to the end and everyone seemed to love it. The real problem was how to find Meeta a new sitar string before we packed up and went to Marquette on Thursday morning. So Ken and I were on the phone the next day trying to locate a string, which we finally did, so Meeta was good to go. Thursday morning we packed all of our stuff in two vehicles and headed up for the 7 hour trek to Marquette, Mi. I was so happy. We arrived in Marquette with just enough time to get everyone checked into their hotel, and then we were off to Kaufman Auditorium to do a sound check. We met Sara Cambensy there and she told us about all the press and promotion that was happening. It was impressive. the story was on the front cover of the local paper, T.V. 6 news was coming out to do a report on the workshops and I had to do a radio interview early the next day. We did the sound check, ate a nice dinner and went to bed. The next day I woke up at 6 a.m. to go to a radio station and do an interview on the Mark and Walt show. Walt Lindala is the lead guitarist in a band that I used to play with called the Flat Broke Blues Band, so we have known each other for years. The music for this show however is much different than the blues, so we had plenty to talk about. It was fun. Right after it was over I was off to the venue to get ready for the workshops. The workshops were so much fun! It was just Meeta, Samarji, and myself in the middle of the stage talking about Indian Classical music. We played, talked, took questions, and played some more. In all we did three shows for over 2000 students. T.V. 6 news was there doing a story too. For lunch, my wife Jody and I took everyone up to Mt. Marquette, which is a great look out point over the whole city. They enjoyed it and began to understand why I am always talking about my hometown. The next day everyone just did their own thing until the soundcheck. I went to Northern Michigan University in the morning to do a tabla workshop for all the percussion students that study under Dr. Jim Strain. He was my first percussion professor. I took a year of music at NMU before going out to Cal Arts. It was Dr. Strain's first year as a professor at Northern. It was great to see him. It was a fun workshop and everyone had great questions. The whole thing lasted over 2 hours. Once it was over it was time for a little rest and getting ready for the soundcheck. So....What can I say about the concert itself....well it was truly a dream come true for me. 20 years earlier I was on the same stage for my first public performance ever. It was a drum duet with my friend Rob Parkkonen. It was for the middle school talent show. Now I find myself on stage with one of the greatest living exponents of rhythm doing a drum duet. All the work that went into the show by the KOZORA guys and Meeta and myself all paid off. It was a magical night for me and I am still in a dream state about it. The pictures that my wife took from the front row are a litte fuzzy and don't capture the entire event in one shot, which is exactly how I remember it. I don't know that I will ever have an opportunity quite like this, where my passion, my work, and my roots all come together in one night. I want to thank everyone who was involved with this show. You really made a dream come true. The next day it was back to Ann Arbor. Before we left though, I wanted to take Samarji and Meeta to a place called Presque Isle in Marquette it is one of the most beautiful city parks in the country, and it was good to take in before the long drive home. Those aren't TOO fuzzy. Btw, I have pics from the trip that I need to send you via email. I swear I'll do it sometime soon. 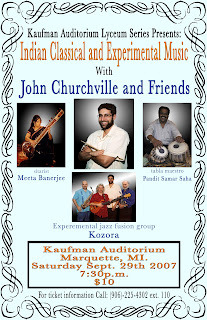 Hi John Churchville .Nice to see your Blog.Really it was a memorable Dual Flute concert on 18th Sept2007.We often view the video given by Prof.Steve.and the Audio given by Yourself.The quality of the recording is superb and studio quality.I quite recall the party also with you and Rohit and Steve on the night of 18thSept.Hope to see you in near future also.